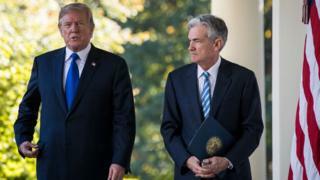 President Donald Trump has said he is “not happy” about the fact that the US Federal Reserve is raising interest rates. The comments raised eyebrows in the US, where presidents are expected to avoid criticism of the central bank in deference to its independence. Mr Trump argued that higher rates put the US at a disadvantage and impede faster growth. However, he added that he is “letting them do what they think is best”. The Fed has raised interest rates twice already this year. US Federal Reserve Chair Jerome “Jay” Powell, who was appointed by Mr Trump earlier this year, said this week that policymakers remain committed to further, gradual increases. The Fed is responding to a recent uptick in inflation that economists attribute in part to a mix of increased government spending, tax cuts and new tariffs. The rate rises, which make borrowing more expensive, are intended to head off uncontrolled price rises as the US economy expands. If the Fed moves too aggressively, however, it could curb economic activity so severely that it helps to provoke a recession. Mr Trump said increased rates had resulted in a stronger dollar which put the US at a disadvantage compared with places where central banks are holding interest rates steady. The dollar index, which measures the dollar against a basket of currencies, fell about 0.1% after the remarks became public. It later regained much of that ground. Mr Trump has said before that he favours low interest rates, and dismissed concerns about his interference. “Now I’m just saying the same thing that I would have said as a private citizen,” he said, according to CNBC. President Trump's continued engagement with North Korea raises curiosity over its economy.